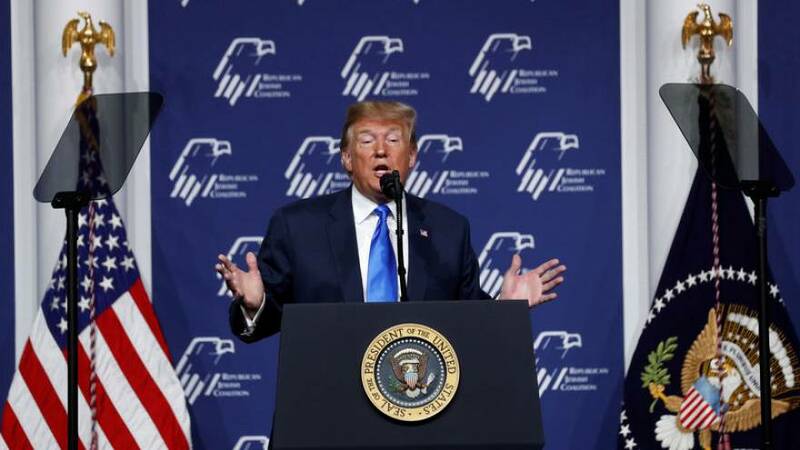 LAS VEGAS (Reuters) - U.S. President Donald Trump said on Saturday he made the controversial decision to recognise Israel's 1981 annexation of the Golan Heights after getting a quick history lesson during a conversation on a different subject. Speaking at the Republican Jewish Coalition gathering in Las Vegas, Trump said he made the snap decision during a discussion with his top Middle East peace advisers, including the U.S. ambassador to Israel, David Friedman, and son-in-law Jared Kushner. "I said, 'Fellows, do me a favour. Give me a little history, quick. Want to go fast. I got a lot of things I'm working on: China, North Korea. Give me a quickie," Trump said to laughter from the Las Vegas crowd. "'How do you like the idea of me recognising exactly what we're discussing?'" said Trump, recounting the conversation. Trump, who typically demands short sharp briefings and is known for his colourful retelling of stories, said Friedman was shocked, "like a wonderful, beautiful baby," and asked the President if he would actually do it. Israeli Prime Minister Benjamin Netanyahu visited Trump last month. At their March 25 meeting, Trump signed a proclamation officially granting U.S. recognition of the Golan as Israeli territory, a dramatic departure from decades of U.S. policy. The move, which Trump announced in a tweet days prior, was widely seen as an attempt to boost Netanyahu who is up for re-election on April 9. Israel captured the Golan in the 1967 Middle East war and annexed it in 1981 in a move not recognised internationally. "I went - 'BING!' - it was done," Trump said on Saturday, describing the swiftness of his decision. "We make fast decisions. And we make good decisions." When Trump asked the crowd who will win Israel's election - there were shouts of "Bibi!" Trump responded "I think it's going to be close. Two good people." Netanyahu is fighting for his political survival against former top general Benny Gantz, a political novice. Republican megadonor Sheldon Adelson, who is reportedly gravely ill, watched the speech in person. Earlier three protesters stood on their chairs as Trump began to speak, shouting "Jews are here to say - occupation is a plague." The rest of the crowd quickly drowned them out with chants of "USA! USA!" They were physically removed by security guards. "He is going back to mommy and he will be reprimanded," Trump said of the protesters. "She gets it."